There is only one character of colour to speak of in White Cat and that is Sam Wu. Sam, is Cassel's roommate who takes over the bookie business when Sam get thrown out of school for sleep walking. Sam is incredibly smart, drives a hearse he has converted to run on bio-disel and wants to get into special FX for a living, though his parents have completely different plans for him. Sam is Cassel's model of what it looks like to be a good friend and therefore always seems to be there at Cassel's beck and call. I can think of only one instance in White Cat of Cassel helping Sam, instead of it being the other way around. Unfortunately, much of Sam's inclusion in the story pulls the reader away from the over arching mystery. I wish Sam had been better integrated into the plot and hope that changes in the second book of this series. 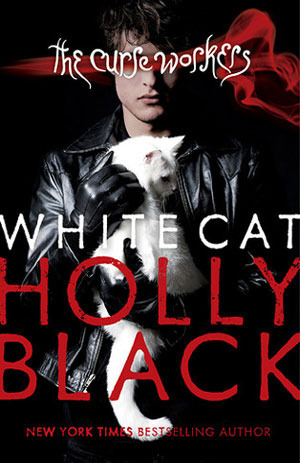 Like many books in this genre, White Cat is overwhelmingly White. It is also completely erased in terms of LGBT people. Disability only seems to occur as a consequence of over using one's ability to work. White Cat could have have been a lot more inclusive than it is. The only time oppression is brought up is in connection to workers. Here's the thing, it makes sense to discriminate against someone who can kill you with the slightest touch of a finger. It makes sense to be cautious around someone who can change or steal your memories, affect the way your emotions work, or break your bones with a single touch . As an analogy to the real discrimination marginalized people face, what Black has done is not only offensive, it quite simply does not work. Given that there is never any real discussion on issues historically marginalized people face, I tend to believe this intentional blindness is simply the way that Black has set her world up to work. I picked up White Cat because I absolutely have a weakness for the bizarre in books but unfortunately, that is not what I got. The way that magic works in this universe is interesting but told through the eyes of a protagonist who just seems so very ordinary, it failed to draw me in. The mystery is actually pretty good but how it is concluded is a little ridiculous to say the least. White Cat doesn't suffer from much of the angst typical to YA urban fantasy and for that I am thankful. The best I can say about White Cat is that it falls into the category of meh. It's not so boring that cleaning your bathroom becomes an exciting option but it's far from thrilling.